Corn futures closed up 6 cents last week, finishing at 3.63 on Friday. What is causing the depressed prices in corn futures and will it continue? Let’s review the latest corn market news and price analysis. CHINA – U.S. TRADE TALKS: It was yet another week where the primary market focus was on China – U.S. trade negotiations. However it ended in a similar fashion to previous trade talks with progress reportedly being made but still no deal. President Trump made the following statements from the Oval Office regarding meetings held this Thursday: “We’re getting very close to making a deal. That doesn’t mean a deal is made, because it’s not, but we’re certainly getting a lot closer. And I would think with, oh, within the next four weeks or maybe less, maybe more, whatever it takes, something very monumental could be announced.” How’s that for a definable timetable? Sarcasm noted. The market reaction to the lack of deal, underscored once again by continued ambiguity regarding a potential finish line, was both predictable and frustrating; resulting in corn and soybeans giving back a large percentage of the week’s gains during Friday’s trading session. At the risk of writing a market commentary that sounds more like an Op-Ed, I would argue U.S. corn and soybean producers continue to bear the brunt of China’s tariff counter-punches dating back to when the U.S. first initiated its tariffs on Chinese goods on July 6th, 2018. I’ve stated several times before that China remains an indispensable trading partner with the U.S. specifically regarding their purchases of U.S. soybeans. In 2017/18 China accounted for approximately 60% of total U.S. soybean exports (+1.2 billion bushels) and nearly 30% of totalU.S. soybean demand. However since China instituted its 25% tariff on U.S. soybeans, U.S. soybean shipments to China have been virtually non-existent. In fact in November 2018 Chinese imports of U.S. soybeans were zero with Brazil displacing the U.S. as China’s preferred origin for soybeans (in 2018 Chinese imports of Brazilian soybeans jumped 30%). Over the last few months China has returned as a buyer of U.S. soybeans however the purchases have typically been in response to China – U.S. trade talks. This lending the impression the buys were more of a concession in an attempt to strike a deal versus a lasting desire to return as a consistent buyer of U.S. soybeans. The reality is the U.S. lost its single biggest end-user of soybeans during a year where they needed China the most following record 2018/19 U.S. soybean production of 4.544 billion bushels and record 2018/19 U.S. soybean ending stocks totaling 900 million bushels. Could this story still have a positive ending for U.S. corn and soybean producers? Absolutely. Several trade wires continue to run with the idea that when China and the U.S. finally consummate a trade deal it will include up to $50 billion of annual Chinese demand for U.S. agricultural goods. 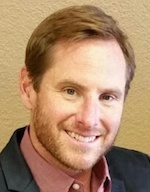 Such an outcome would undeniably be a “HUGE” win for U.S. corn and soybean producers if in fact it proves enforceable and equates to tangible results. However until that happens China – U.S. trade drama continues to serve as a significant “black cloud” hanging over the market; ultimately preventing it from focusing on real corn and soybean specific S&D factors/price drivers. Let’s hope for the best over the next 3 to 4-weeks, which would include a finalized trade deal with China and the ability to move on to assessing traditional fundamental price drivers such as spring planting in the U.S. and Weekly Crop Progress reports. 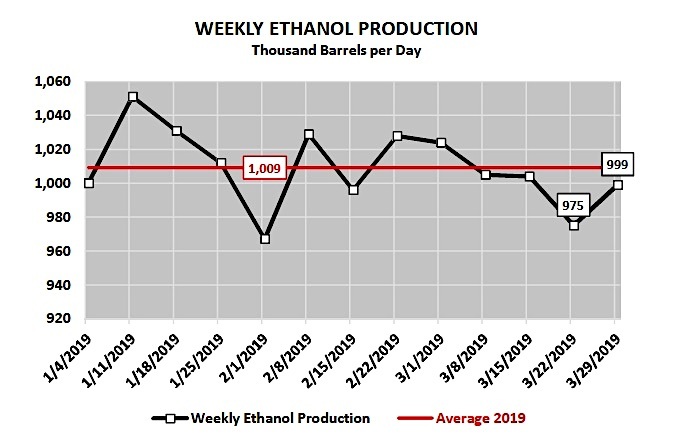 WEEKLY EIA ETHANOL UPDATE: Wednesday’s EIA report showed U.S. ethanol production rebounding back up to 999,000 bpd for the week ending 3/29/2019. That figure represented an increase of 25k bpd week-on-week and was also slightly higher than the 4-week average of 996,000 bpd. More importantly U.S. ethanol stocks dropped to 23.992 million barrels, down 456,000 barrels from last week’s record high. I wouldn’t necessarily say either figure is “Bullish” corn but rather a price supporter at current levels with some traders concerned that U.S. corn-ethanol demand could be lowered in the April 2019 WASDE report from the March estimate of 5.550 billion bushels. NOAA’s 8 to 14-day forecast continues to show above-normal precipitation with below-normal temperatures for the entire Corn Belt. Therefore the producer’s ability to begin spring field work will likely be delayed. Additionally traders have started to focus on projected April precipitation for the Dakota’s. Due to the heavy snow accumulation this past winter, flooding is already a major factor and one that could limit the expected corn acreage expansion this spring in both North and South Dakota. In the March 29th Prospective Plantings report the USDA estimated a +1.6 million acre increase in North and South Dakota 2019 planted corn acreage (North Dakota 4.05 million acres; South Dakota 6.00 million acres). Friday’s Commitment of Traders report showed the Managed Money short in corn increasing to -246,735 contracts as of the market closes on 4/2/2019. That compares to a Managed Money short of -203,414 contracts a week ago and a net long position of +116,911 contracts last year on approximately the same date. I would argue the Money is still over-weighted to the downside; however I’m not sure the cold/wet weather’s enough of risk factor this early in April to “scare” Money Managers into significantly reducing their short position exposures. That said it might prove a worthy adversary as far as dissuading them from adding to their current short positions, which should be enough to stall downward momentum under $3.56 to $3.58 CK. Technically, initial topside resistance in CK19 next week should come in the form of the 35-day moving average at $3.717. During the month of March $3.80 CK19 was essentially the “stopper” on continuation rallies over the 35 and 50-day moving averages. To the downside the market will continue to watch the new contract low of $3.56, which was established on 3/29/19 following the release of the March Prospective Plantings and Grain Stocks reports. That needs to hold and should with water in the forecast for the Corn Belt. Outliers remain China, and to a lesser extent, Mexico and the future of the USMCA trade agreement, following Trump’s recent threat to close the southern border.